He then moved into management. His first client was Stuart Lewis-Evans, who was killed in a crash. Ecclestone then managed the Austrian Jochen Rindt, who also died in a crash but became the first driver to be posthumously named world champion. In the 1970s, Ecclestone bought the Brabham team. He sold the company in the late 1980s, and then launched his bid to overhaul F1's commercial arrangements. Ecclestone now owns a network of companies which have the exclusive right to sell and market the International Automobile Federation's (FIA) TV rights. In 2000, the FIA agreed to lease him the rights for 100 years, which further increased his position. In March 2000, he sold 50% of one of his companies, Slec Holdings, to German broadcaster EM.TV. The shares then passed to media giant Kirch, which acquired another 25% of the business, leaving Ecclestone with 25%. Kirch collapsed in 2002, with three banks - Bayerische Landesbank, Lehman Brothers and JPMorgan - taking over its stake in F1. While talks go on about the sale of the banks' shares, Ecclestone's grip on the sport remains is undiminished. Now 73, he has often said that the pursuit of wealth is no longer the main driving force in his life. 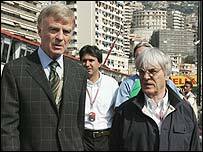 But, as the dispute over the future of Silverstone has shown, Ecclestone will never allow himself to come off second best in any deal. At one time he considered a career in politics, but was advised against it because it was thought his family background would count against him. The qualified barrister has, however, used his skills to good effect as president of motorsport's governing body the FIA. While Ecclestone has a reputation as a streetwise wheeler-dealer, Mosley is seen as a cerebral operator, responsible for implementing a raft of changes to the way the sport is run. His involvement with motor racing began in the late 1960s when he co-founded March - a racing car manufacturer. The company then moved into building F1 cars and built up a dominant position in American Indy Car racing in the 1980s. Mosley, however, extricated himself from March to concentrate on F1 politics. He was Ecclestone's lawyer during a bitter dispute within the sport in the early 1980s, and played a key role in drafting the Concorde Agreement which settled the issue and still governs F1 today. By 1991, Mosley had become president of the sporting arm of the FIA. Two years later, he was elected president of the whole federation. Through the FIA, he has involved himself in road safety, and takes pride in the part he played in the introduction of the Euro NCAP crash test standards. Over the years, Mosley has had a number of spats with F1 car makers over his plans for the sport. He announced in July that he intended to quit his FIA role at the end of the season, saying that he found discussions with team owners increasingly tedious. But he subsequently decided to stay on until at least October 2005 after the FIA senate asked him not to step down. Mosley has also had public rows with Ecclestone. But many F1 insiders believe these are just part of a well crafted plan to strengthen their control over the sport.